In 2018, AIChE marked its 110th anniversary. This milestone provided us with an opportunity to reflect on how the Institute has grown and evolved. Over the past decade, AIChE followed a plan that enabled us to nearly triple revenue and double net assets. As described in this report, the Institute has created value for our members, the profession, and society, in line with our vision. We added the RAPID Manufacturing Institute, the AIChE Academy for education, journals dedicated to emerging fields, topical conferences, and technical communities that address social challenges. AIChE will continue to advance the profession globally, while remaining broad, diverse, and inclusive of all constituents and stakeholders. We will explore models for engagement with our members and stakeholders, developing our talent and teams. We will strive to be the best, as exemplified by our leadership in process safety. We will continue to strengthen our financial position and act nimbly. AIChE will strengthen our representative constituencies (e.g., industry, academic, or government); our technical and topical-interest groups (e.g., divisions, forums, and technical entities); and our many distinct geographic and demographic communities — including local sections and underrepresented groups. We will continue to support and sustain advanced manufacturing, including the RAPID Institute, and work with the Center for Chemical Process Safety (CCPS®) to achieve its Vision 2020 objectives. AIChE will develop and curate timely content across multiple delivery methods and venues. We will focus on workforce and professional development gaps in areas such as safety, digitalization, and advanced manufacturing to serve the needs of members and industry. AIChE will develop initiatives to engage and retain engineers from all backgrounds, across the profession and career continuum. We will engage those in middle and high schools, explore alternative entryways to chemical engineering (e.g., community colleges), develop and promote inclusion programs, and leverage partnerships with other organizations, universities, and companies. AIChE will address critical issues impacting society by leveraging the expertise of our members. We will engage with key constituencies in government, industry, and academia to respond to pertinent issues, such as safety, sustainability, public health, education, manufacturing, and the environment. AIChE will also perform societal outreach, demonstrating how chemical engineers can, and do, make the world a better place for all. AIChE will deliver content using interactive and collaborative platforms, with an eye toward global impact and accessibility. We will also develop and deploy new tools for educational training. The exciting news is that AIChE made progress toward all of these objectives in 2018. Some of them are highlighted in our 2018 annual report, which can be downloaded below. 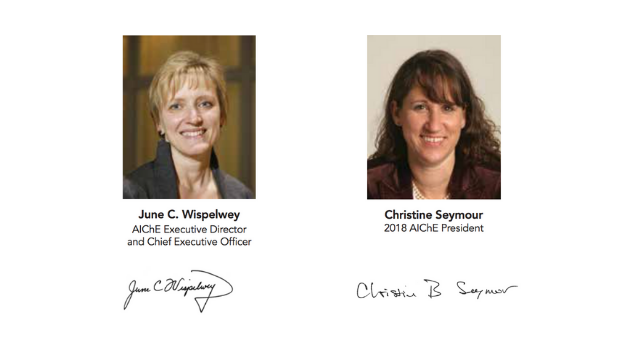 As we move beyond our 110th year, AIChE would like to thank our many dedicated volunteers, members, donors, and staff for their diligent work in helping to position the Institute to grow and address future challenges. AIChE enters 2019 strong and with goals for building an even stronger association. Hear more from AIChE President Kimberly Ogden.